Britain's 400m world champion Christine Ohuruogu has had a lifetime ban from the Olympic Games overturned on appeal. Ohuruogu was banned from racing for a year for missing three drugs tests before returning to win world gold. Under British Olympic Association laws, athletes banned for drug offences are ineligible for all future Games. But the BOA said in a statement: "The panel decided that Christine Ohuruogu's appeal had been successful due to significant mitigating circumstances." The 23-year-old told a news conference that she was delighted with the news. "I was very relieved when I heard the verdict and now I can move on," said the London-based athlete. "I would love to compete for Britain at the Beijing Olympics if I am selected for the team. She added: "I accept full responsibility for missing the tests. The rule was there and the punishment was there. "But I can honestly say I am not a drugs cheat." Ohuruogu also warned other athletes to avoid complacency when it comes to dope testing in order to avoid suffering a similar fate to hers. UK Athletics chairman Ed Warner revealed there were three fellow competitors who had missed two tests. "Athletes should make a note of what happened to me," she told BBC News 24. "I would tell them to get as much help as possible from their coaches, from the people around them, just to remind them not to miss the test." Ohuruogu had originally been banned for missing three out-of-competition tests after failing to be at training locations at times she had specified to testers. Under UK Sport guidelines athletes have to specify an hour each day for five days a week when they will be available for a random drugs test. 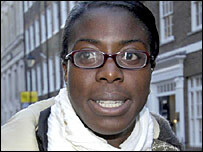 Ohuruogu took her appeal to the Sports Dispute Resolutions Panel who ruled in her favour. The BOA statement added: "The appeals panel unanimously agreed that the written evidence supplemented by the answers given by both parties at the oral hearing provided the necessary information to take an early decision in Christine Ohuruogu's appeal. "It was agreed that any delay in making the decision would not be in the interests of any of the involved parties." Ohuruogu returned from her ban to win gold at the World Championships in August. She has been tested 14 times in the last year, always with negative results. The three-and-a-half hour hearing took place on Monday at Ely Place Chambers in London and the three-man panel was chaired by Nicholas Stewart QC. The fact that the BOA by-law is not adopted by the World Anti-Doping Agency (Wada) was in Ohuruogu's favour, and triathlete Tim Don and Judo competitor Peter Cousins have had bans overturned in similar appeals. BOA chief executive Simon Clegg said: "The BOA and the panel both stress that no advance notice out of competition testing is a fundamental part of ensuring an effective fight against doping in sport. "Athletes must be fully aware of their obligations to keep their whereabouts information up to date at all times and must ensure that they are available for testing at the designated times and places. "The BOA will now be pleased to welcome Christine Ohuruogu as part of Team GB in Beijing next year in the event of her successful nomination by UK Athletics. "Since the BOA is yet to receive the reasoned decision on this case it is inappropriate for us to make any further comment at this time. "It is our intention, however, to comment more fully on the circumstances relating to this case and any wider issues once we have received the full judgement." Despite Ohuruogu being the third athlete to have had a ban overturned for missed tests, UK Athletics chief Warner does not believe BOA's by-law should be ditched. "Christine did commit a doping related offence, but we felt the one-year ban was a proportionate punishment to fit the offence not the lifetime ban," he said. "But we remain supportive of BOA's by-law to punish out those who are guilty." UK Sport's chief executive John Steele also welcomed the decision from the BOA but suggested their by-law may need reviewing. "Christine has served her sanction under the terms of the World Anti-Doping Code, so we welcome the fact she has been cleared by the BOA for Olympic selection," he said in a statement. "We would argue that a more sensible approach would be to impose such an Olympic ban only in the case of a 'serious' offence - namely one that carries at least a two-year period of ineligibility under the Code."